Nobel prize for Donald Trump? If Obama can get a 'futuristic' award why can't he? Will Donald Trump get Nobel Peace Prize after a successful summit with North Korean leader Kim Jong Un? Of course he deserves it. if Trump takes the Nobel home would be the fate of Kim Jong Un? A Catch-22 for the Nobel Committee? Does US President Donald Trump deserve a Nobel Peace Prize? Trump's rightwing supporters had given him the ultimate peacenik cap much before he signed an agreement with North Korean dictator Kim Jong Un in Singapore on Tuesday. Trump supporters' Nobel demand had met ridicule and derision from the garrulous Left. However, if former president Barack Obama was given a 'futuristic' Nobel prize in 2009 for his campaign promises, why can't the Nobel Committee smile on Trump now? When two of the world's most cantankerous leaders meet for a highly improbable, and implausible, round of discussions, anything would have happened! Worsening of relations? Escalation in military conflict? Kim's promise to starve his countrymen further to make more ICBMs? And a Trump threat of bombing north Korea flat out? Singapore might have been left ruing the decision to host the two handsome men for a brawl and foot the bar bill at the end. But nothing negative happened! In fact, the summit produced some promises that will augur well for the region. The biggest announcement from Singapore is the 'complete denuclearisation of the Korean peninsula' and a Trump commitment to give security guarantees for Pyongyang. 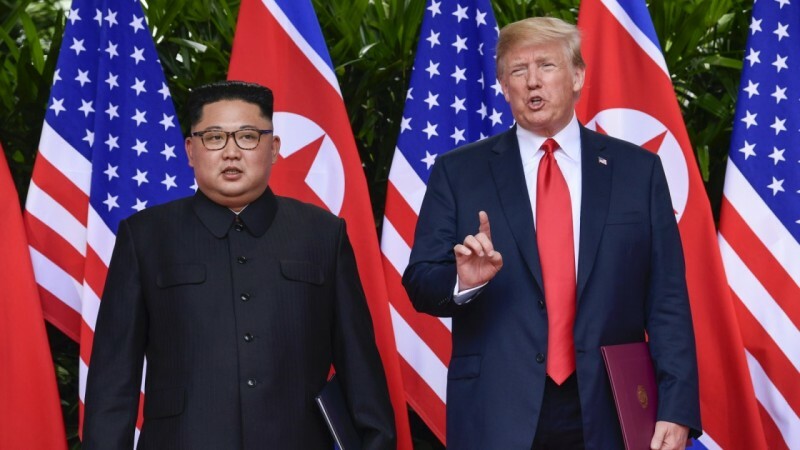 "President Trump committed to provide security guarantees to the DPRK and Chairman Kim Jong Un reaffirmed his firm and unwavering commitment to complete denuclearisation of the Korean Peninsula," the two-page joint statement said. That means Kim will halt the nuclear programme. A complete denuclearisation of the peninsula, if that happens, will lead to lasting peace on the peninsula as well. That means the two Koreas, which are technically at war with each other for more than 50 years, will be able to sign a ceasefire agreement. And that would further mean normalisation of ties between the two factions and possibly an eventual reunification. These are long-term prospects. 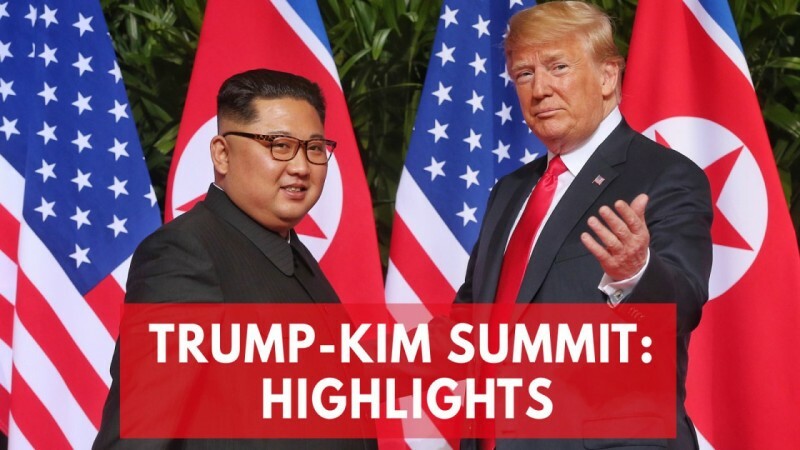 In the immediate aftermath of the summit, there are other positives. The constant threat of war coming out of Pyongyang will subside. The US will stop it 'provocative' military drills with South Korea. The channel for communication between the adversaries will be open. The ties between Washington and Pyongyang will only improve, at least for a time. In response to Kim's offer of total denuclearisation of the peninsula, Trump offered "security guarantees" to Kim. However, the offer didn't have important details. How would the denuclearisation happen? In how much time? Is the denuclearisation irreversible? Will the US or the UN be allowed to verify the denuclearisation process? Importantly, even Trump seemingly did not insist on some of the long-held US demands. The US had initially wanted to make the denuclearisation "complete, verifiable and irreversible". But now the offer is only complete. Not irreversible and verifiable. While Kim got away on another important count -- he made no offer to stop missile tests -- Trump too kept the sanctions tool in tact on the US side. Who won, Trump or Kim? The jury will be out on this question for long. But at the moment it looks like Trump has had his way. Kim and North Korea were driven to the wall. They had to accept that the vaunted nuclear deterrence that they built up all these years has failed. Trump's diplomatic victory was in realising at the right time that it had the upper hand over North Korea. In saving grace, a pariah leader got to share the world stage with the most powerful president. Kim's befuddlement on the occasion would be evident if one of his statements is deconstructed. "I think the entire world is watching this moment. Many people in the world will think of this as a scene from a fantasy...science fiction movie." Kim's outing was a fantasy that turned real. And he got fulsome praise from Trump. He said Kim was a great personality, and very smart. Trump added that he developed a "very special bond" with Kim as well. irrespective of who would go down in history as the one who made the most gains, the fact remains that both the leaders pledged to defuse a dangerous problem for the world. Is that enough to get a Nobel peace prize? More than enough. Again, if one were to take the Obama Nobel prize as a benchmark, Trump should certainly be given the peace prize. The Nobel committee hoped Obama would do great things for the world. The prize was a reward for the future achievements. It was the prize for Obama's well meaning rhetoric. The world was unwilling to wait for the fruition of the rhetoric. It had a surreal trust in him. However, here's a man whose presidential run was mocked at throughout. At every turn Trump was vivisected, hunted down. He was mercilessly underestimated, vilified and lampooned. The world that expected Obama to work miracles just after winning presidency had almost universally condemned Trump. Only his partisan cheerleaders had kept him going. And look at what he has achieved. Trump effectively put Kim on the mat. He proved to North Korea that its ballistic missile deterrence meant no serious threat to the US. North realised, late in the day, that its limited number of ICBMs would be incapable of breaching the missile defence shield in Alaska. If it were to try and breach the defence effectively, Pyongyang would have to plonk in humungous resources that it didn't really have. So, if Trump takes a Nobel peace prize to that dump (White House) what would be the fate of Kim Jong Un? Or rather that of the Nobel committee, for that matter? For what's good for goose is good for the gander. If Trump gets a Nobel prize for the summit in Singapore, Kim should also get it too. That will be the Catch-22 for the Nobel Committee.